We already have existing sites on our production server, a few using different ip addresses, a few using the same, all with different domain names. 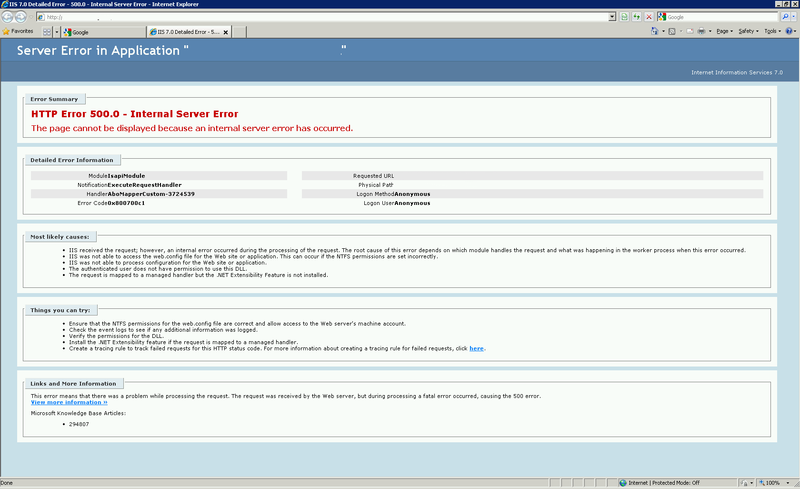 Now we/I have 2 remaining sites to setup, but they keep re-occuring iis7 errors. Showing that there is NTFS errors, can't login, or find the web.config file. Even though the file is just right there. I set up the app pool to use the app pool identity. Although I have tried putting is IUSR as well. But for some reason it just refuses to display anything other than the same 500 error. Here is the screenshot of the error message i keep getting. This is an "old" issue, but do you have 1.1 and 2.0+ .Net Framework apps running in the same AppPool? You need to make sure the apps to seperate those versions, since they don't play nice. I also have had a few setups where the incorrect version of ASP.Net was targeted (1.1 instead of 3.5), which also caused errors. How do I add a querystring to a default document in iis7?